Meanwhile, back in New York City ... after biking through Central Park, looking futilely for cupcakes near Bryant Park, and dining at the Hard Rock Cafe it was time for Jamie and I to move on to the next part of our New York City adventure - the Brooklyn Bridge! Heading back down into the subway we grabbed the 'S' train from Times Square to Grand Central Terminal and then jumped on the '6' train to the Brooklyn Bridge-City Hall stop; from there we just followed the crowds! Obviously I'm not the only person to think that walking across the Brooklyn Bridge would be fun! You have to admit, though, it would be pretty cool, right? I mean, come on, it's the bridge people have been trying to sell each other for years ("yeah, and if you believe that I've got a bridge you can buy!") and the history is pretty neat, too. After all, we doesn't love stories of danger, death, and daring-do by we mere mortals who look to tame the land around us? 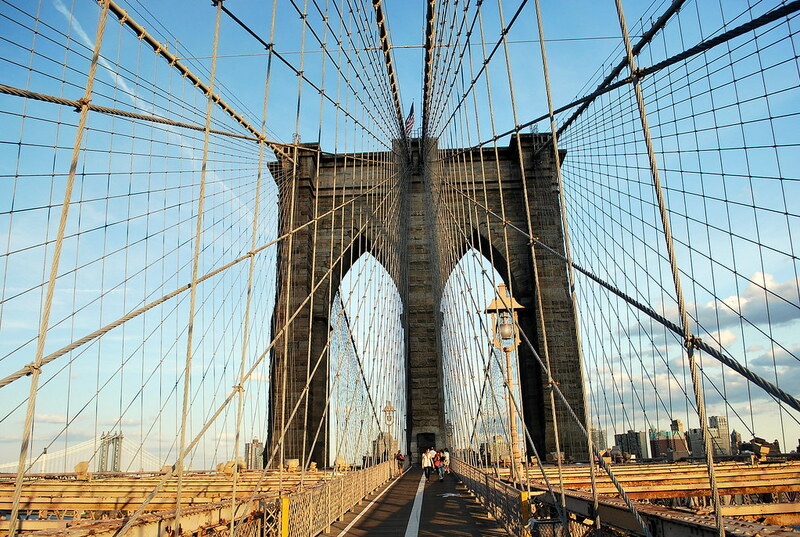 Stretching 5,989 feet across the East River, the Brooklyn Bridge is one of the oldest suspension bridges in the world as well as the very first steel-wire suspension bridge built. From it's completion in 1883 until 1903, it was the longest suspension bridge in the world with a main span of 1,596 feet; it currently ranks at #73 behind such bridges as the Golden Gate Bridge in California, the Mackinac Bridge in Michigan, and the Tacoma Narrows Bridge in Washington. In 1867, a group of prominent leaders formed the New York Bridge Company "for the purpose of constructing and maintaining a bridge across the East River" and two years later, in June 1869, the New York City Council and the Army Corps of Engineers approved the design of German-born John Augustus Roebling who had designed and constructed several other suspension bridges in Pennsylvania, Texas, and Ohio. Before construction of the bridge officially began on January 3rd, 1870 its designer was injured while examining locations for the Brooklyn tower site when his foot was crushed between a ferry and a piling. Within a few weeks of the accident tetanus set in and the elder Roebling died before seeing his historic design become a reality. The project was taken over by Roebling's son, Washington, but in 1872 he was stricken with caisson disease (a decompression sickness, commonly known as "the bends") due to working in the caissons of the bridge. The caissons were large, airtight cylinders in which workers cleared away layers of silt underneath the riverbed that were sealed at the top and filled with compressed air to keep water and mud out. Caisson disease would occur when workers left the compressed atmosphere of the caisson and rapidly reentered normal (decompressed) atmospheric conditions which affected the nitrogen levels in their blood - much like when divers come up too quickly from beneath the sea. 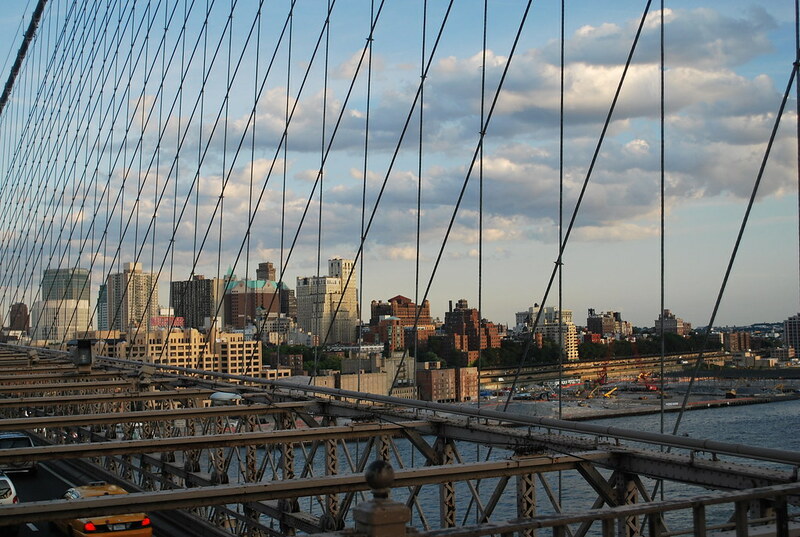 Life in the caissons of the Brooklyn Bridge was reportedly absolutely miserable. Immigrant laborers worked in the subterranean foundations for $2.25 per day in hazardous conditions without electricity, telephones, or any other conveniences. 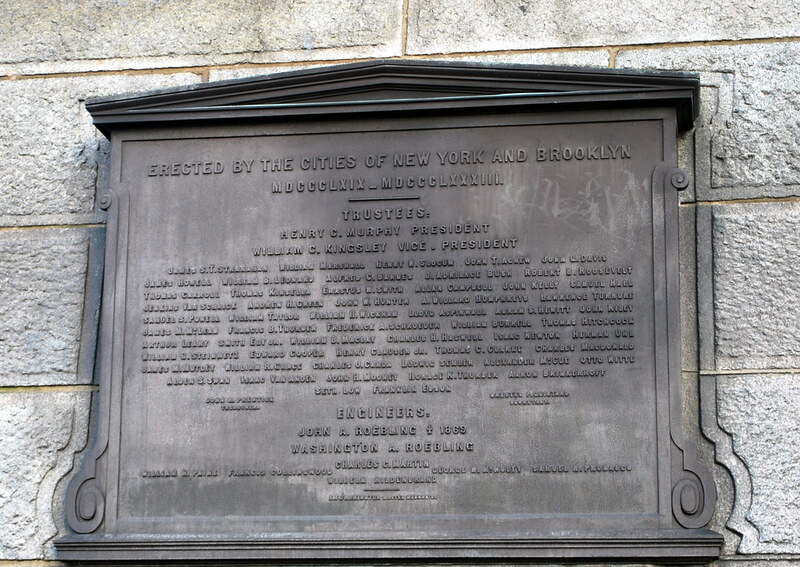 Fires, explosions and caisson disease took the lives of 20 men in addition to leaving Washington Roebling paralyzed. 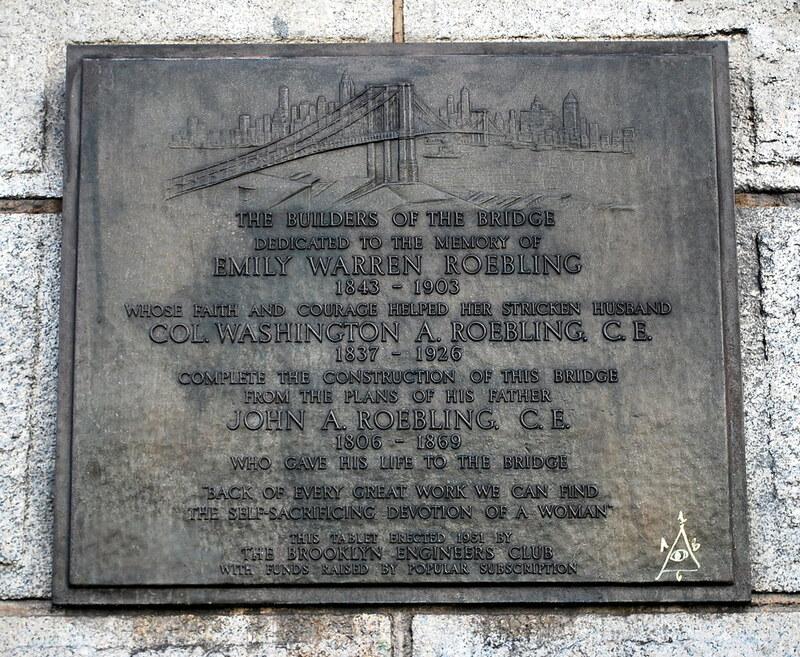 Following his paralysis, the younger Roebling directed the construction of the bridge from his Brooklyn residence with the extraordinary assistance of his wife, Emily, who studied higher mathematics and bridge engineering under her husband's tutelage. Soon she made daily visits to the bridge to oversee her husband's staff of engineers and builders while delivering his wishes. When the Brooklyn Bridge was completed thirteen years later and officially dedicated on May 23rd, 1883 by President Chester Arthur and Governor Grover Cleveland before more than 14,000 invitees, Emily Roebling was given the first ride over the completed bridge with a rooster - a symbol of victory - in her lap. 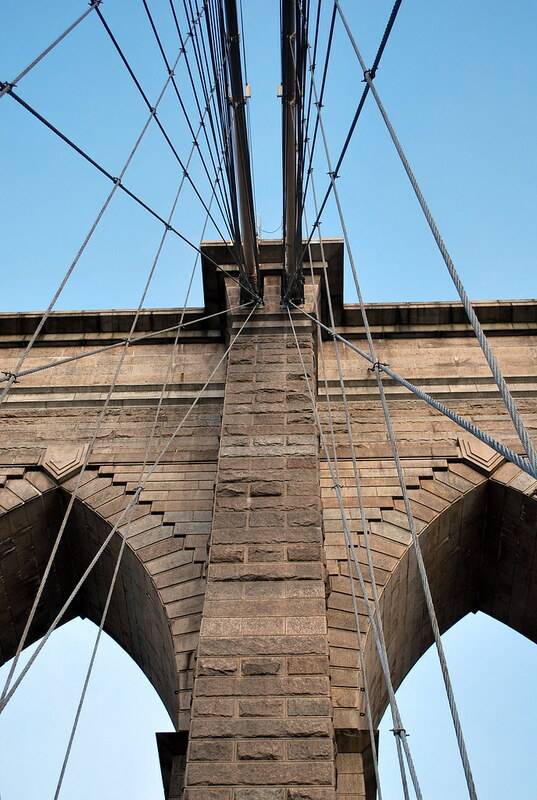 Originally referred to as the New York and Brooklyn Bridge, the bridge was dubbed the Brooklyn Bridge in an 1867 letter to the editor of the Brooklyn Daily Eagle however the name wasn't officially changed by the government until 1915. 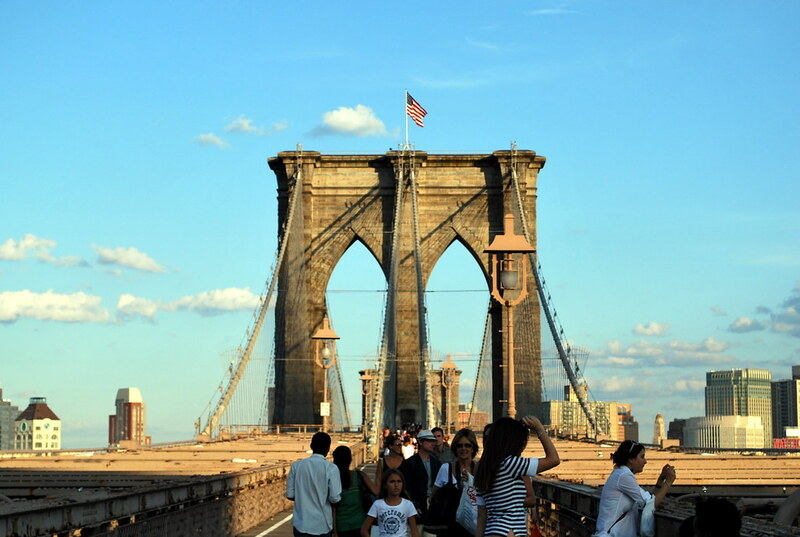 Originally estimated to cost $7 million to build, the Brooklyn Bridge had a final cost of $15.1 million, $3.8 million of which was to purchase land for approaches and the remainder going toward construction. The bridge was designated a National Historic Landmark in 1964. Workers weren't the only ones to die in the history of the Brooklyn Bridge; shortly after the bridge's 1883 opening, on Memorial Day, a woman who was walking up the steps of the Manhattan side tripped which caused her female companion to scream. That lone scream set off a rumor that the bridge was about to collapse and in the panic and resulting crush to get off of the bridge, 12 people were killed and 35 others were seriously injured. A few other interesting pieces of history: In 1884 Master Showman P.T. Barnum demonstrated the safety of the bridge by parading across it with a herd of 21 elephants; the first man to jump from the bridge was Robert E. Odlum on May 19th, 1885 who struck the water at an angle and died shortly thereafter from internal injuries; the first woman to jump off the bridge was Clara McArthur in 1885 who weighted her stockings with 20 pounds of sand so that she would fall feet first - she survived the fall. 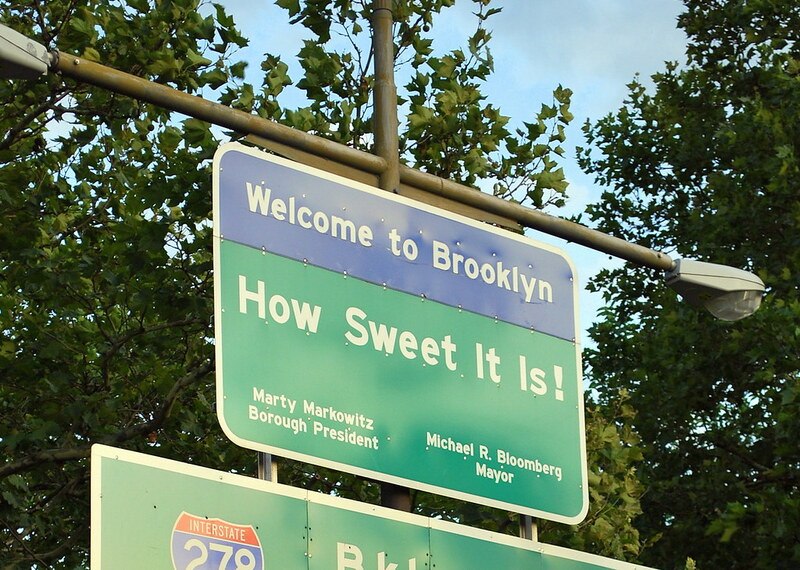 Jamie and I arrived in Brooklyn, home of Jackie Gleason, Neil Diamond, Mel Brooks, Barry Manilow, Al Capone, Woody Allen, and too many others to name, just as it was starting to get dark which really didn't give us any time to explore the area beyond the bridge. We also decided at that time that Coney Island wasn't going to happen this trip as it was starting to get a bit late. After getting a hold of Amanda (who was somewhere in Brooklyn) and agreeing to meet back at Grand Central Station, Jamie and I caught the 'E' train back towards Manhattan. We stopped off at Bryant Park again for soft-serve ice cream from a truck and several bottles of much-needed water before walking through Times Square and catching the 'S' shuttle to meet up with Amanda and Sami who had taken their own train in from Brooklyn. Climbing back on board a MetroNorth train we took our leave of the city around 9:45 and arrived back in New Rochelle at 10:30 for the drive home. All in all, we had a great day and both Jamie and I got to see some great things while Amanda had a good time hanging out with Sami. Even though Cape Cod would have been more relaxing, I guess New York was a good choice after all even though it definitely wore me - and Jamie - out! Thank you. 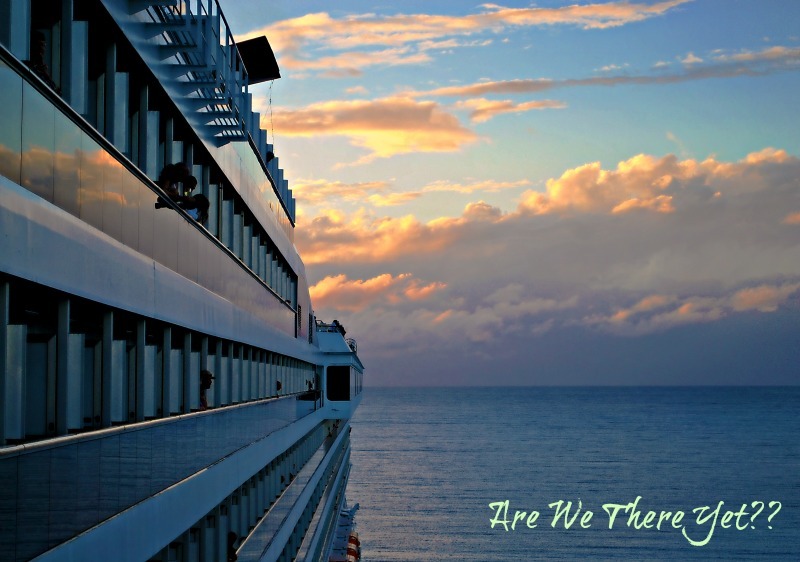 I needed a little escapism this morning and yes I know I've been a very bad blogger lately but it's summer holidays here and we're up to 8 including Nonna, so life has a new and even more hectic pace so blogging has gone a bit by the board. Hubby read a book about Roebling in the last year or do... You should ash him about it the next time you see him. Children of the world have missed out by you not being a history teacher. Loved the video and the music was spot on. How fun. Reminds me when Zane and I walked the San Francisco Golden Gate Bridge. Just as popular I'd expect. Loved the history lesson as always. Another great tourama, Linda! You pack so much in your trips for us to see. i love clair's comment! (clair???) and the music too. excellent post linda, truly! and somehow i always thought jackie gleason was from miami, i know he lived there late in his life, i never thought about him anywhere else! Very cool! And thanks for the history too. I've watched History channel specials on the bridge, but there's nothing like a first hand account. Loved it! And I didn't even have a panic attack! My favorite shots were at dusk, with the sun setting and the cityscape skyline silhouettes. Fabulous, Linda! Great adventure, photos, and writing. Saw "Tacoma Narrows" in the list. This is why the original had to be replaced. Love the video!! And the angles of the pics are just beautiful. You have outdone yourself with this one. I love the way you are documenting your summer time with the girls. They are sooo lucky to have a mom like you. What a great way to spend time with Jamie. Kids grow up way too fast and this will always be remembered as a "mom and I did..." moment. Those girls sure are lucky. And thank you for taking us along. I love seeing these places through your eyes. How sweet this post is!! I love the shot of all the cables and the clouds and my home town of Brooklyn!! you did so much in just one day! Learned so much about the bridge and I lived in NY for 22 years. You know how I love your photos of course. When I was in NYC, my camera broke so I ended up with a lot less photos that I had hoped for. I'll be posting them soon though. More than likely, I'll never see New York but these last couple of posts really made me more aware of a lot of things. I especially liked the "geometric" shots with all of the angles. Really good! I agree with Claire - you missed your calling! p.s. I feel bad for Mrs. Roebling. All she got for her efforts was chicken poop all over her dress. On the Road Again ... This Time to Points North! Central Park & Cupcakes & Coney Island ... Oh My!